Among many definitions of visualisation, I prefer when perhaps it was ideally described as the transformation of the symbolic into the geometric (McCormick, 1987). In this sense, visualisation methods are increasingly embraced to explore, communicate, and establish our understanding of data. 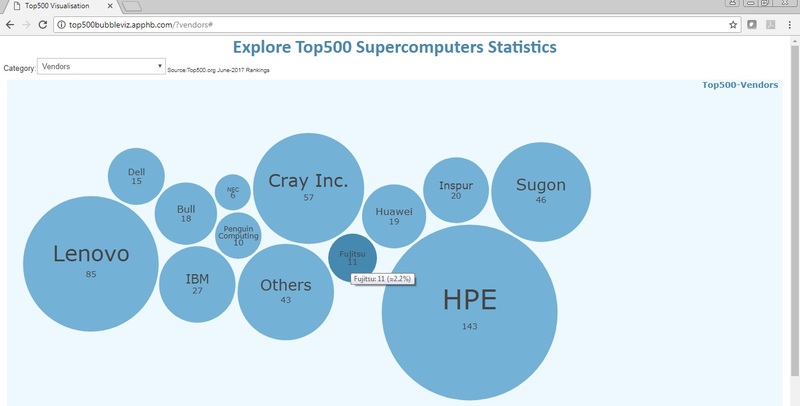 The visualisation mainly uses bubble charts for delivering the statistics about the Top500 list. Particularly, the size of a bubble represents the percentage with respect to the whole 500 supercomputers. 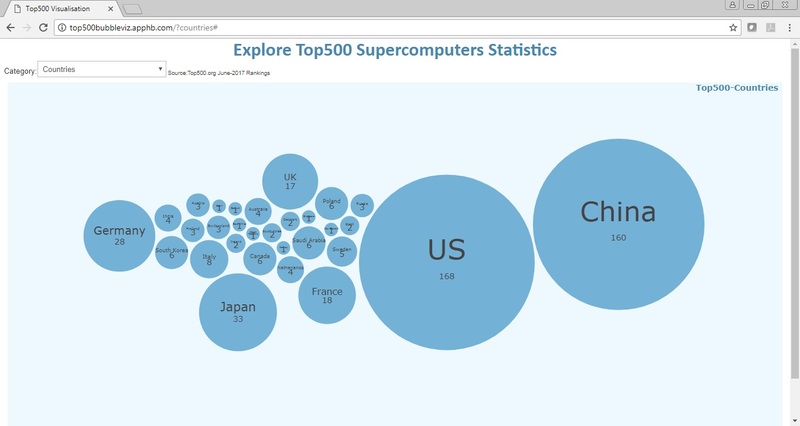 For instance, Figure 2 shows a bubble chart that visualises the counts of supercomputers in countries based on the Top500 June 2017 list. 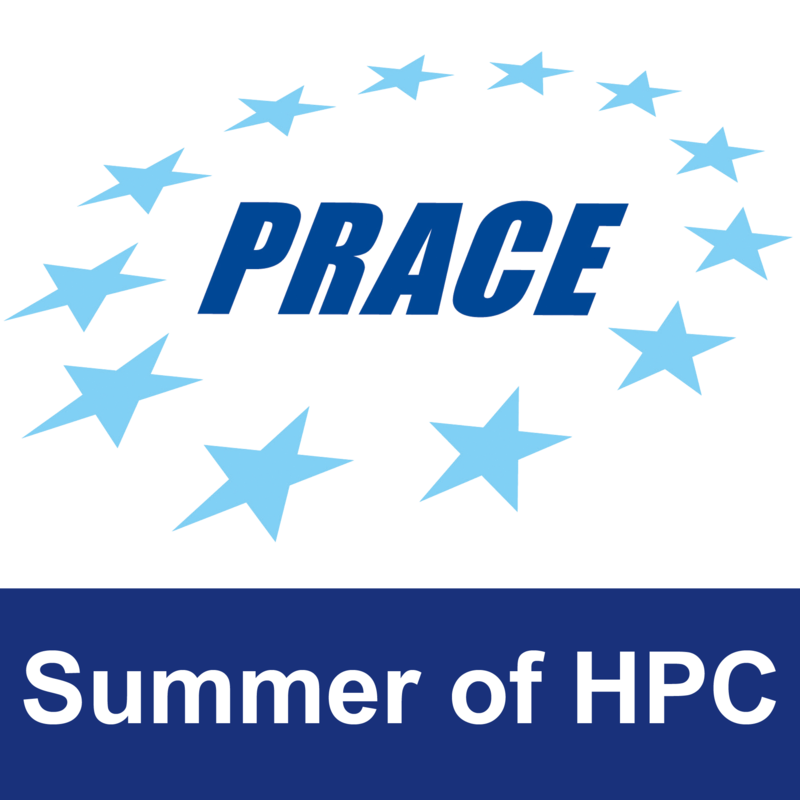 Obviously, US and China have the highest number of supercomputers worldwide. The user can choose a category provided in a dropdown box. The categories included: i) Countries , ii) Regions, iii) Segments, iv) Vendors, and v) Operating Systems. Furthermore, a pop-up tooltip shows up when the cursor hovers a bubble. This can be very useful for viewing the information of small bubbles within the visualisation (e.g. Figure 3). The tutorial below provided by Jim Vallandingham helped a lot to produce the visualisation.